After living in NYC for a while you can settle into your daily routine and forget what amazing activities are available on your door step. Since moving here I have wanted to see a production at the world famous Carnegie Hall, and finally organised tickets to see the National Symphony Orchestra during the 'Spring For Music' festival. If I am completely honest I don't know much about classical music and wasn't entirely sure what I had booked! However, at $25 a ticket I thought it would be worth taking a chance. All tickets for performances during the spring festival were $12.50-25, making it accessible to a much wider audience. Before entering the auditorium we enjoyed a class of wine as we walked around the common parts of the building which had been turned into a museum of past performances and artists. The hall itself is beautiful and our seats were located in one of the boxes. Although good seats, it was pretty squashed in there and I had a better view lady's head in front of me than I did of the stage. That said, for what we paid it was great, but I think I would have been annoyed if the tickets were normal price ($150+). The performance, 'A Tribute to 'Slava', was dedicated to Mstislav Rostropovich who was the music director of the NSO from 1977 to 1994 and conductor laureate until he died in 2007. The performance was streaming live on Classical 105.9 FM and there was a short interview with a friend of the lateMstislav Rostropovich. The orchestra then took their seats and there was a roar of applause as the first violinist, David Aaron Carpenter, and music director, Christoph Eschenbach, took to the stage. I very much enjoyed the atmosphere and it was amazing to watch the orchestra playing together. When you go to the ballet or a Broadway musical the orchestra are often tucked away where you can't see them, so it was great to watch them perform. Unfortunately, however, I didn't particularly like the music they played. I prefer lighter, happier classical music that makes you want to dance, but these pieces were a little darker and more serious. This was entirely my fault though as I should have researched what they would play before I got tickets. That said, it was an unforgettable experience and I am so glad I finally made the effort to go and see a performance at Carnegie Hall. 'Spring For Music' takes place annually, and tickets for 2014 go on sale in August. It is a great way to get the full Carnegie Hall experience without the expensive price tag. For more information visit http://springformusic.com. Spring has sprung and summer is on the way! The weather in New York has been lovely the past few days and I have especially enjoyed my runs in the park. However, it's not great for my running time as I keep stopping to take photographs as Central Park is so beautiful at the moment! Can't get enough of the pink! Now is a great time to see the park it all it's spring glory. I would recommend going early in the mornings, especially at the weekend, so you can enjoy the views before it gets too crowded. Happy spring! There is something magical about Cirque Du Soleil, and since the arrival of their big top in Queens, New York I have wanted to see "Totem". The show takes place in the impressive blue and yellow 'Grand Chapiteau' with a modern set incorporating a giant turtle shell and interactive marsh background. As soon as the music started I got goose bumps, which stayed throughout most of the show. I was immediately immersed into the world of Cirque Du Soleil with their unusual musical score and brilliant costumes. All of the performers were incredible, but I especially enjoyed the five unicyclists who used their feet to juggle and throw bowls, which they then caught on their heads! 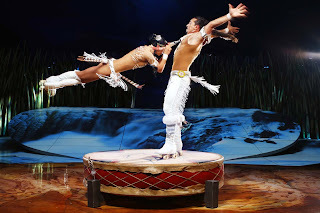 The aerial acts were breath-taking and I was on the edge of my seat for the beautiful roller skating couple who spun at amazing speeds on a drum only 1.8m in diameter. "Totem" is an awe-inspiring show which will leave you wanting more and wishing that you too could run away and join the circus. Inspired by this amazing experience, I decided to try a class created by Cirque Du Soleil called "Jukari - Fit to Fly". Derived form an old Sicilian dialect, Jukari means 'to play' so I was intrigued and, if I'm honest, a little nervous to find out what would be involved. This class is only offered at Equinox, where they have a studio consisting of 16 'fly sets' which are similar to trapezes. I was welcomed by Lynze Schiller, one of only two Jukari instructors in the US, who put me completely at ease. Her enthusiasm for Jukari and "Totem" helped to create that Cirque Du Soleil magic. By wearing show style eye makeup and sharing fun facts about the acts before we started, I felt as if I was in a rehearsal for the show rather than in a gym class. The class is choreographed to incorporate a variety of different exercises, all set to music. It was a thoughtful playlist which included songs from the Cirque shows as well as current dance music. During each song we were shown a new skill and I was soon jumping, spinning and flying across the room. The set can be altered for different uses, and towards the end of the class we turned it into a swing. As well as traditional swinging, we were were taught how to fast spin, it was so much fun! This was the most enjoyable class I have ever taken and I didn't stop smiling the entire time. It was a tough work out encompassing cardio, strength and flexibility and my muscles are still aching days later, but it was worth it. I can't think of a better way to spend my time in the gym than pretending to be a Cirque Du Soleil acrobat! "Totem" is currently playing in the Big Top at Citi Field until May 12th before it moves on to Philadelphia. Tickets are available athttp://www.cirquedusoleil.com/en/shows/totem/tickets/new-york.aspx. To find out more about Jukari, visit https://www.facebook.com/Lynzefit. I am very excited to be working with 'Romio', which is a brand new social platform that connects it's users with their local neighbourhood. You can make and view recommendations and find out about local businesses in your area. It is made by New Yorkers for New Yorkers, although visitors are welcome to use it too! My favourite aspect of the site it that you can ask a question online and someone from that area will be able to help you out. For example, if you are on the Upper East Side and want to find a good coffee shop with wifi, you just post a request and a 'local expert' will give you a recommendation. I am very proud to say that I am one of the 'local experts' on the site, specialising in the Upper West Side. As you know I have always been keen to share my experiences to help others and thought this would be another good way to do it! I would love it if you could sign up and follow me, as with every social network you want to have as many friends and followers as possible! I also think you would find it useful if you live in New York, are moving here or are just visiting. I have found some useful recommendations on the website already and it will only become more interesting as more people sign up. Check out the website at http://qa.romio.com and follow me on the site, my user name is 'New Girl New York'. Hopefully I will see you online there soon!